SteamyRomanceBooks.com is a bookstore and ebook promotion consultancy. It’s owned and operated by book-industry professionals with extensive promotion and production experience. We respect romance book readers, so we try to choose the very best books for our store. We post new ebooks daily (usually including one that’s free), so there’s always something new to see! 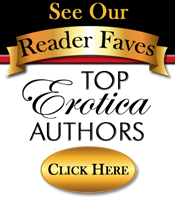 We also cater to authors in the romance and erotica niches, offering laser-targeted promotion created just for them. Please see our Author Services page for more information. Steamy Romance Books is part of the BookGoodies Network of sites for book lovers.